Department of Agricultural Extension (DAE) published New job vacancy Notice at daesaao.teletalk.com.bd. DEASAAO Job circular offer Some New vacancy in this post. Krishi Diploma Pass student can apply DAE job circular 2018. You have to complete your DEASAAO online application before 28 February 2018 at 05:00 PM. Candidate can easily apply daesaao online application from visiting www.daesaao.teletalk.com.bd . For Apply You have to collect your Pass port size image with signature. DEASAAO SMS format also available at ejobscircular.com . Let`s check how to sms for Department of Agricultural Extension in 2018. After Submit your online application you must be pay for DEASAAO application fee. For complete your payment follow this sms format below. After Complete your DEASAAO SMS possess you will received your user id and Password with pin number. public security division written exam date and Admit Card Download will published soon . You can Download DEASAAO Teletalk Admit Card from ejobscircular.com . 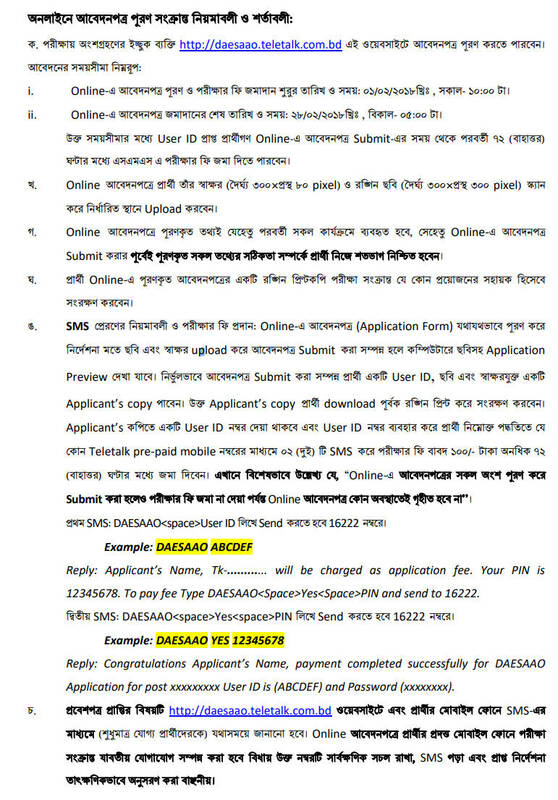 DEASAAO MCQ Test , DEASAAO Written Exam date updated by www.dae.gov.bd . If You want to apply www.dae.gov.bd you have to visit there official website . You can Also download DEASAAO Job Circular Application Form at ejobscircular.com . For Next Updates about Department of Agricultural Extension job circular,Notice,Exam Result or Admit card Download stay with us.